Kirby Wright was a Visiting Fellow at the 2009 International Writers Conference in Hong Kong, where he represented the Pacific Rim region of Hawaii and lectured in China with Pulitzer winner Gary Snyder. He was also a Visiting Writer at the 2010 Martha’s Vineyard Residency in Edgartown, Mass., and the 2011 Artist in Residence at Milkwood International, Czech Republic. He is the author of the companion novels Punahou Blues and Moloka’i Nui Ahina, both set in the islands. The End, My Friend, his futuristic novel, will be released in 2013. The sentiment of the second half – that “the dance we do” in the face of tragedy “means everything” – can seem naïve, even quaint, especially if you happen to read this during a period of personal upheaval. 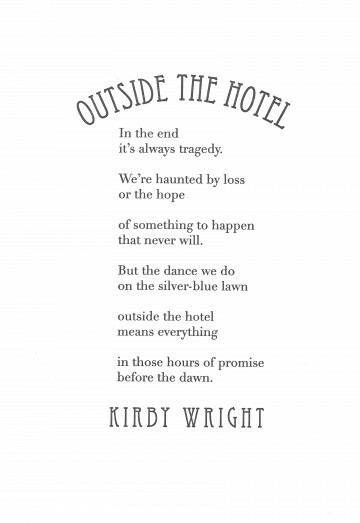 Kirby Wright knows we all live there, sometimes, but he also knows we inch forward, couplet by couplet, through other emotional territories. If you happen to read this poem during a period of personal renewal, “the hours of promise/ before the dawn” may feel just right. Either way, the poet offers us perspective and a chance to see ourselves more clearly. Dancing on a hotel lawn late at night is an ecstatic experience, highly Romantic. It needed a typeface like Didot, where the difference between thin and thick strokes is marked and gives the letterforms a sense of movement. Didot is considered a neoclassical typeface, but it was first designed around the beginning of the nineteenth century when Romanticism was taking hold in Europe. Eccentric is brand new for the twenty-first century, but has a sway of its own plus a height that reinforces the idea of a tall, thin window frame, through which the action of the poem can be glimpsed.